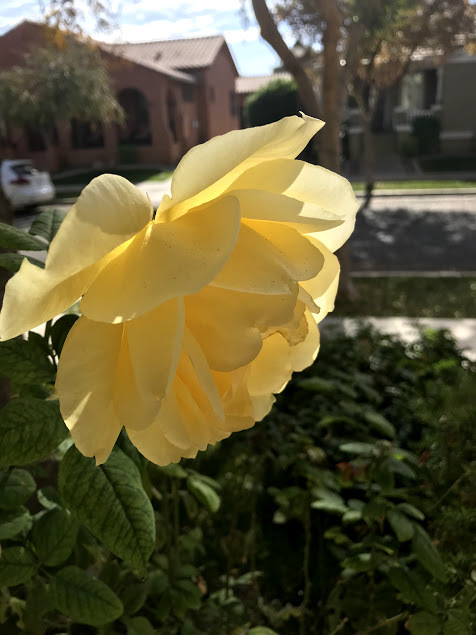 Yesterday morning I awoke around 6 and opened up the doors of our AZ house the way I always do so as to let in the fresh morning air and listen to the birdies sing. I wasn’t awake longer than 10 minutes or so when my phone binked, indicating a text message. It was from our daughter Heather, who lives in Vermont. Oh no, I thought in typical Nana fashion. Who died? Good morning from beautiful Vermont, Heather texted. She included a screen shot of the temperature. It was 24 degrees below zero at 8:15 a.m. There were two pieces of good news: 1) The wind chill was no colder, also a minus 24. This was not surprising to me as had the wind chill been colder, it would have been Neptune; and 2) The high temperature was going to reach 12 degrees ABOVE zero. A veritable heat wave in Neptune/Vermont terms. 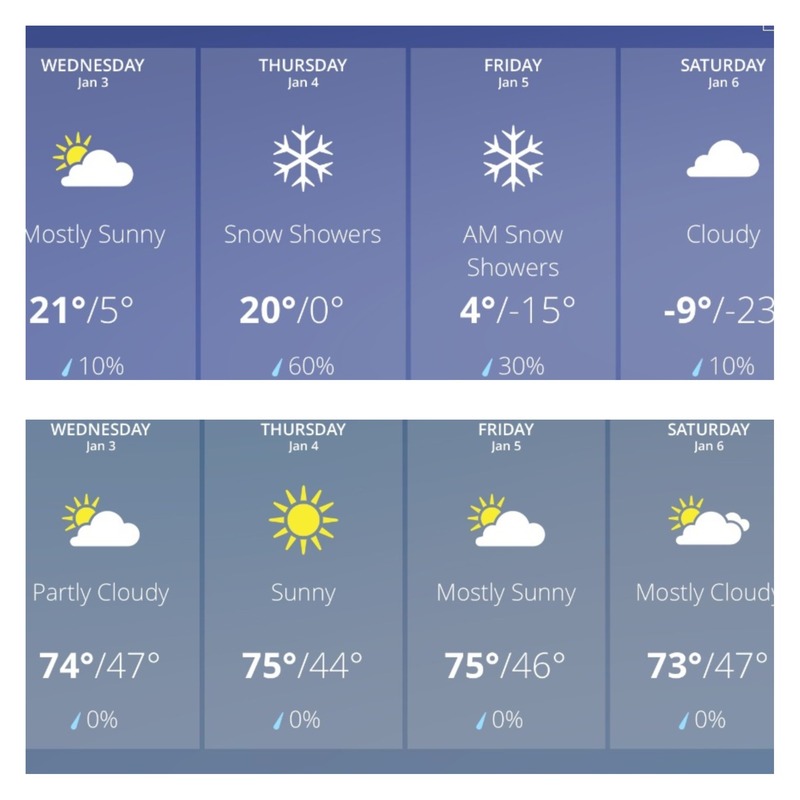 Here are the forecasted temperatures over the next few days – the top in Montpelier, VT, and the bottom in Mesa, AZ….. Still, Vermonters never complain. Why would they, as it obviously would do no good. They also never let the weather stop them from an activity. I’m not certain about 24 degrees below zero, but the more common winter Vermont daytime temperature of 25 degrees would not stop the Montpelier schools from sending the little darlings out for recess. Don’t forget to fasten the top button of your jacket, Billy. On the other hand, the 60 degree temperature when Maggie, Jen, Austin, Lilly and I set off to do some errands at an outdoor mall yesterday required hooded jackets for the kids. Children of the desert have thin skins. They would have been horrified to see our 12-year-old grandson Alastair run out into the snow barefooted on Christmas Eve to help us unload the car. Without flinching. In the meantime, Austin and Lilly and I wandered down the street to the children’s area. There was a playground that was closed due to maintenance, and most of the stores were not yet opened. 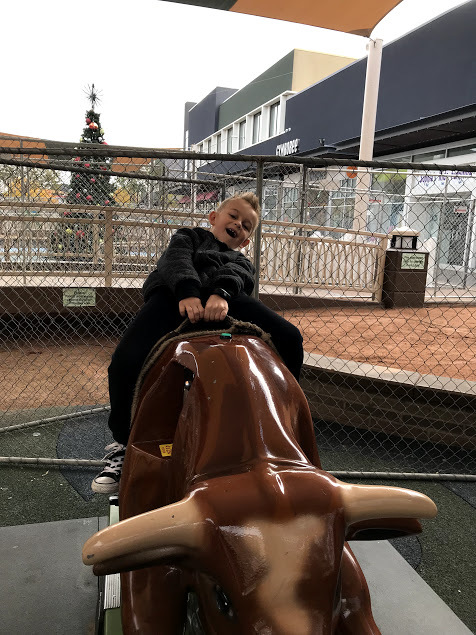 However, there were a couple of little rides that the two kids enjoyed as we waited for the stores to open…..
Austin makes this bull riding look like something at the National Western Stockshow Rodeo. As soon as the clock struck 10, we wandered into a pet store and ogled all of the adorable little puppies. I could hear Sarah McLachlan singing in the background as the dogs looked pitifully at us through the bars of the cages. I told the kids to pick out which puppy they would buy if all was fair in the world. After a great deal of time and a lot of consideration, Lilly picked the scraggly-looking Chihuahua and Austin chose the Dalmatian. As for me, it was the Yorkie all the way. Our adventure concluded when Maggie and Jen picked us up and we drove over to our niece Heather’s house to say hello and give the kids a chance to play for a little bit. Austin buddied up with his boy cousins and Lilly and Faith began playing dress-up. 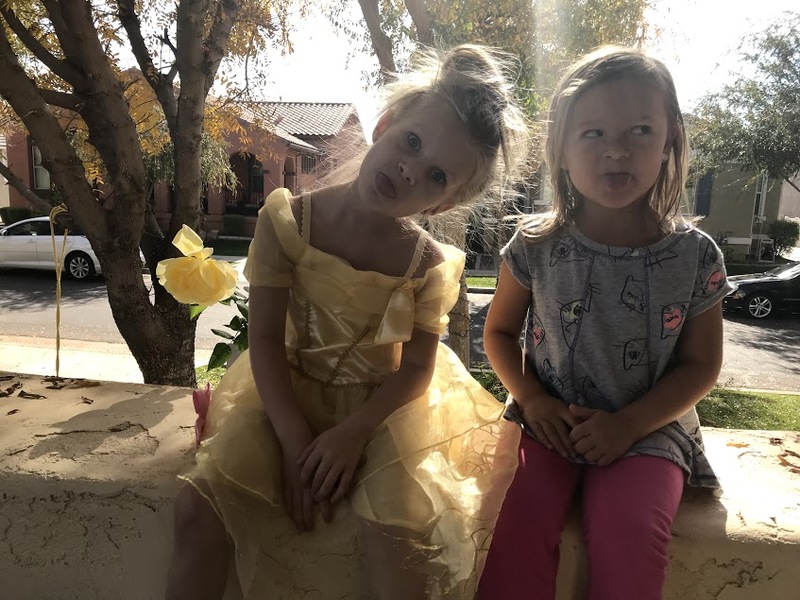 Before we knew it, both were dressed as the Princess Belle and playing with baby dolls. Ah, to be a kid again. 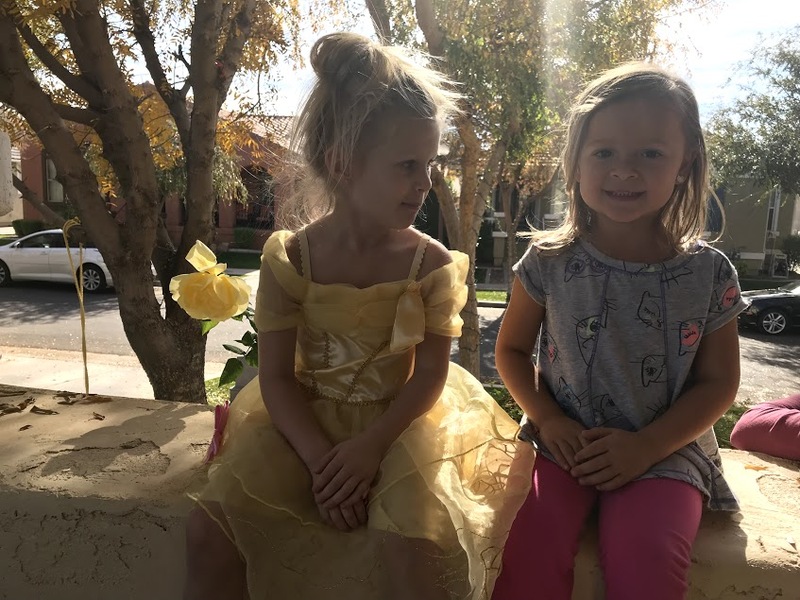 I couldn’t help but enjoy this yellow rose, which would not be growing in Vermont…..
And in a matter of seconds, these two girlies went from this…..
A January day in the desert. Do not, I repeat, do not show the rest of the country your blooming roses when it is beyond cold. It just makes us crabbier!